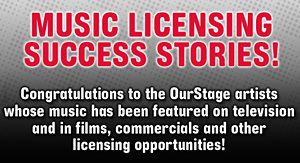 Every month after finals judging OurStage offers a $1,000 Speciality Grand Prize to the highest-ranked artist in the Specialty Music Channel. That's $1,000 to go toward recording that next album, funding your next tour, getting new gear or anything else you want to take your career to the next level! Earn three opening performances for Jane's Addiction, plus prizes from Guitar Center and Gibson! Singer-Songwriter (Male) Artists, Win A Year’s Supply of Free Strings & Accessories From Ernie Ball! Enter For A Chance To Perform At The Ritz Ybor On July 23rd! Latin Artists, Enter The Tr3s Latin Music Channel For A Chance To Become "El Headliner"
Premium Member Competition: Win a Mentoring Session With Music Industry Veteran Don Ienner!